Let’s start with the story. Thomas is a boy of about sixteen. He wakes up in a metal box with no memory of anything before being in that box. Once the box is opened, Thomas finds himself surrounded by other boys in a large stone courtyard open to the sky. It is a perfect square surrounded by really tall stone walls with doors set into the middle of each one. This group of boys have built a society inside this courtyard based around the fact that they are in the middle of a gigantic maze. Every day they send runners out in order to try and find a way through, but every day those runners have to be back before dark because those big doors will close and they will be shut out. The main reason this is bad – there are horrible half machine, half blob creatures called Grievers that come out in the dark and attack. Sometimes they kill, but most of the time they sting you, which will leave you with horrible pain and delusions for several days. They call this “the Changing.” The upside is that you might recover some of your memories every time you go through this. I thought this was an interesting premise. A huge maze, with no visible way out. A Lord-of-the-Flies-type lifestyle, only much more organized and civil. Who are these kids? Why are they there? The ones who have been there the longest have been there for two years. Tons of questions, which is really good to keep you interested in the story. And then, when you think you have some idea of what’s going on, a girl appears in the Box. There has never been a girl in the Maze before. She will change absolutely everything, and there’s nothing anyone can do about it. I had two complaints about this book. For one, Thomas is a sympathetic character, to be sure, but he’s not very interesting. Throughout the way there are several things and/or people who tell him that he’s interesting or strange, but he’s not, not really. He can be kind of boring at times. The other issue I had was with the writing. When you take writing classes, or read anything that talks about writing technique, you always hear the phrase, “Show, don’t tell.” It means that instead of just saying, “Johnny was scared,” you need to show what happens to Johnny when he’s scared. Does he break into a sweat? Start shaking? Pee his pants? Or show what has made him so scared. Don’t just tell the reader that he’s scared. Show the reader what scared looks like with Johnny. And just so we’re clear, there is no Johnny in The Maze Runner. Make sense? Good, because there was a lot of telling in this book. It obviously wasn’t enough to make me stop reading, since I’m well into the second book in the series right now, but it was enough that I noticed it and it kept getting on my nerves. That said, the other characters, the setting, and the plot were intriguing enough to make me want to know what happens to these people. You know they have to get out of the Maze at some point, but the walls are always moving. And there’s always Grievers out to attack them. It seems like an impossible puzzle, and knowing that they have to solve it somehow makes for a compelling story. I’ve decided to start using my GoodReads rating to help with my reviews here. I gave it 3 out of 5 stars. It’s definitely a good read, but nothing earth shattering. 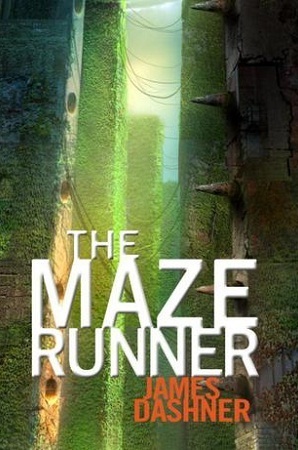 Dashner made me curious as to what happens next, which means I will probably finish the series. Or at least book 2. This is on my list to-read but I haven’t felt the urge to grab it yet. Maybe I’ll let it sit there for awhile longer. It’s definitely worth a read. It’s really interesting, but not a favorite.